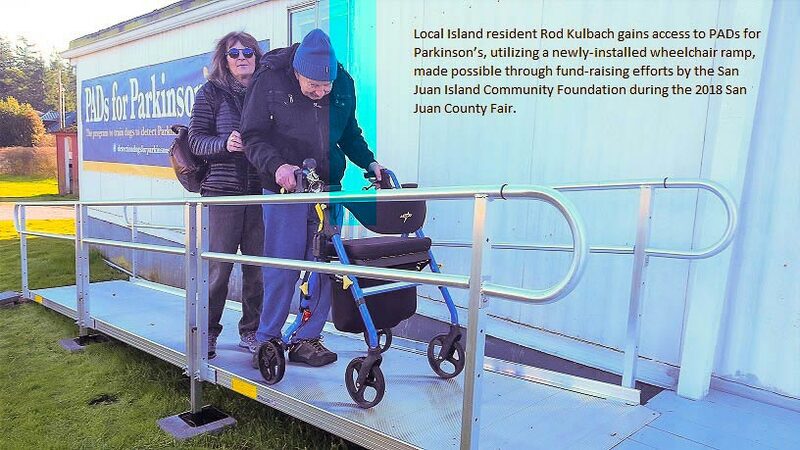 PADs for Parkinson’s of San Juan Island would like to express our heartfelt gratitude to the San Juan Island Community Foundation, The SJIC Women’s Fund, and the many caring Islanders who stand behind these important community organizations. Your support has provided needed funding to increase local access to the PADs Program, the first program in North America to train dogs to detect Parkinson’s Disease. We wish to especially acknowledge and extend our bow of thanks to the Pohlad Family Fund and the Peg Gerlock and Phil Johnson Fund, both donor advised funds of the SJICF, for your contributions to the SJI Community Foundation’s fund-raising efforts on behalf of PADs. Due to your support, we were able to purchase and install a wheelchair ramp for our SJI County Fairgrounds facility, providing access to all who are mobility-challenged, many of whom are PADs sample donors, so that they too, can observe the Parkinson’s Alert Dogs in action. You have also made it possible for all San Juan Islanders to peer inside this program with a PADs community newsletter to arrive in mailboxes in early 2019. You are making this ground-breaking program accessible to all Islanders. We extend our continued gratitude to the training session volunteers, board members and handlers who continue to support our 14 fabulous sniffer dogs; to the many who attend the live demonstrations of the dogs at work; and to the many individuals and support groups who supply donor samples for the Program. We extend our very deep gratitude to our sample donors who are battling Parkinson’s Disease. The work we do is for you. On behalf of the entire PADs team, we are grateful, blessed and honored to be a thread in the fabric of a community that continues to work for a better world. PADs is the first program of its kind anywhere to train dogs for the detection of Parkinson’s Disease. The Program was spurred by the 2015 news of Joy Milne, the woman in Scotland who was proven to have the ability to smell Parkinson’s Disease. Formed in early 2016 as a research project, PADs soon grew to become a 501(c)(3) nonprofit organization with a three-fold mission as follows: 1) Train dogs to detect Parkinson’s Disease; 2) Supply reproducible training protocol for other trainers; and 3) Assist research efforts that bring us closer to a cure for Parkinson’s Disease. The SJI Community Foundation is comprised of more than 40 funds representing individuals, families and organizations with the purpose of providing a valuable community resource for both donors and local nonprofit organizations. The SJICF provides donors with an avenue for funding mission-directed nonprofits by supplying trusted stewardship for philanthropic efforts. The SJICF provides nonprofit organizations with avenues and guidance for achieving and providing accountability for fund-raising goals. Since forming in 1994, the SJI Community Foundation has operated with the mission to help the San Juan Island Community thrive through inspired and informed generosity under trusted stewardship. Approximately 60,000 Americans are diagnosed with Parkinson’s Disease each year. There is no cure for Parkinson’s Disease, and neurodegenerative damage to the brain begins years prior to tremors. Today, the disease can only be clinically diagnosed once tremors become evident. Detection of the disease prior to tremor stage could help with dramatically slowing progression of the disease. Isolating an odor in the disease may provide an avenue for early detection.